The 25-year-old Caratini is scheduled for surgery on Monday. He had been a pleasant surprise for Chicago, batting .571 with a homer and five RBIs in six games. He got hurt on a swing during Thursday night’s 2-0 victory over Pittsburgh. A CT scan confirmed a fractured left hamate. Taylor Davis was recalled from Triple-A Iowa to replace Caratini on the roster. The 29-year-old Davis is a .278 hitter with three RBIs in 13 career games. The Cubs could look outside the organization for catching help while Caratini is out. 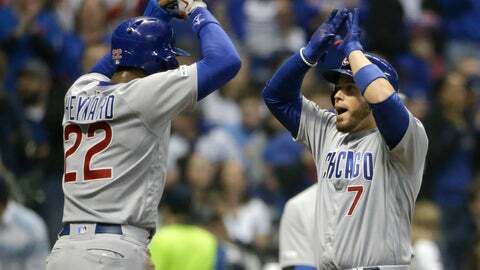 “I wouldn’t doubt that we’re probably looking a little bit,” Maddon said before Chicago’s 5-1 victory over the Los Angeles Angels. “I would say that’s probably true, but for right now we’re really happy with Taylor. He’s really grown among the group.